"As a creative director, I can completely understand that they [Apple] created this new baby and they want to make sure it gets born looking gorgeous. But as a creative director, I don't feel completely comfortable letting Apple do the creative." — Lars Bastholm, chief digital creative officer at Ogilvy & Mather Worldwide. That was what Bastholm told The Wall Street Journal on the news that Apple's upcoming iAd program will require advertisements to go through an approval process and require Apple to build the ads for aesthetic and functionality reasons. It is one of several hurdles, along with price (1 cent per banner impression and $2 per view), to reach more than 85 million iPhone and iPod Touches sold. For the launch, marketers will pay as much as $10 million, which is much higher than the $100,000 or $200,000 most agencies are used to paying. 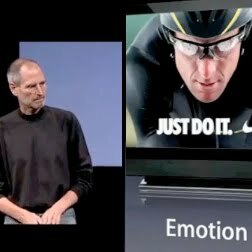 One early example is Nike (it has endorsed the Apple creative), which Apple has been using to introduce the iAd concept. How to build an app advertisement isn't the only advice Apple CEO Steve Jobs recently shared with Nike. Mark Parker, president and CEO of Nike, shared Jobs' advice at Fast Company's Innovation Uncensored conference. "Get rid of the crappy stuff," he said. There are two ways to take anything Steve Jobs says. You can think of him as an egomaniac, as some people reportedly do. Or, you can think of him of someone who is always trying to raise the bar higher, which is why you won't see Adobe's Flash technology on an iPhone. He said more than that. "Flash was created during the PC era--for PCs and mice," Jobs said in the letter. "New open standards created in the mobile era, such as HTML5, will win on mobile devices (and PCs too)," Jobs recently explained in an open letter. "Perhaps Adobe should focus more on creating great HTML5 tools for the future, and less on criticizing Apple for leaving the past behind." Adobe won't argue the point. It is reported to be working to improve Flash, specifically to appease Mac, despite what Philip Elmer-DeWitt had to say about it. When you add it all up, some people might think Apple only wins because its competition is lousy. But maybe Jobs and crew would welcome the opportunity to be pushed a little harder, with someone not only developing better products but better advertising to boot. While there are some great examples out there, communication has become more complacent as of late. While social media has shown some companies how integrated communication can work, turf battles still exist with everyone — public relations, advertising, marketing, corporate communication, etc. — fighting for dominion over the same space. The results are sometimes convoluted. According to one recent survey by Vocus, 43 percent of public relations professionals feel they should own social media and 34 percent of marketers feel they should own social media. Seriously? Seriously. Someone should sit those folks down and tell them no one owns it. Or, perhaps, more accurately, nudge and remind them that the company not only owns social media but their departments or contracts as well. The first rule of order ought not to be who's in charge, but how can we accurately and provocatively communicate the company's message. And with that in mind, can anyone blame Apple for wanting the opportunity to set a higher bar for advertisements? Say what you will about the company, but its messages match the product across all communication channels. The company already knows that the the communication of tomorrow will be both striking (advertising), responsive (public relations), and interactive (technical). See for yourself.